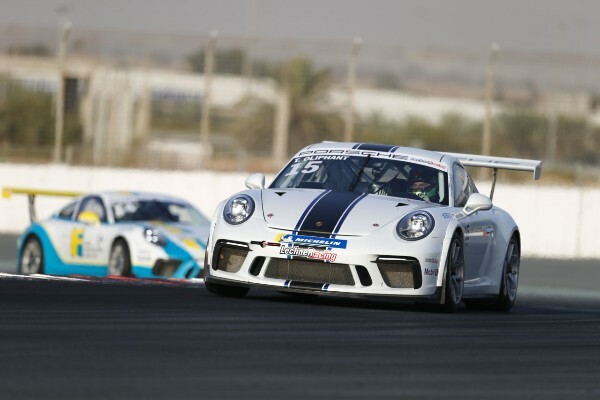 Tom Oliphant of Great Britain has captured a memorable win in the opening race of Round 3 of the Porsche GT3 Cup Challenge Middle East at the Dubai Autodrome, with Oman’s Al Zubair second and Frijns of the Netherlands third. The championship, which is known as the first and only professional motorsport series in the region once again produced more spectacular high-octane motorsport action. The stunning victory by British star Oliphant came courtesy of a heroic performance as the series leader showed his true grit and determination to fight back and win from an unlikely sixth place on the grid. Oliphant had set the fastest time out of 17 drivers in qualifying, but suffered a five-place penalty thanks to an infringement in the previous round. Despite being relegated to the third row of the grid, Oliphant took the chequered flag after taking full advantage of incident between Dylan Pereira of Luxembourg and Al Zubair. Pereira had held the lead for the first 10 laps of the race, but failed to finish after the unfortunate collision. In collecting maximum points for the third time in five race outings so far in Season 9, Oliphant and has now extended his lead in the overall standings by eight points to 121 points, building on his strong showing in the early races. Speaking after crossing the line 1.056 seconds ahead of Al Zubair, Oliphant said: “I really enjoyed that! Winning the race today feels extra rewarding because of where I started on the grid. I initially set myself a target of finishing third, as I knew a podium position would be a success from where I began the race. “I had a great start, and by the opening corner I was up into third. I didn’t want to do anything silly as this was the position I aimed to finish in. Over the course of the race my lap times were getting quicker and the car really found some extra speed in the second half of the race. I put the pressure on Al Faisal Al Zubair and after some slight contact between him and Dylan at the front, I took the opportunity to pass both and move into first place. Al Zubair’s fortunate second place finish ensures the gap to Oliphant remains slender with the Omani securing 113 points after five races, with the sixth race taking place tomorrow. Consistent Dutch driver Charlie Frijns holds onto third overall with his podium finish and has 93 points in the championship standings. Outside the main podium places, UAE resident Glynn Geddie from Scotland had a season best finish in fourth, newcomer Jean-Baptiste Simmenauer of France was fifth and sixth place went to Sweden’s Christoffer Bergstroem. The first race in 2018 took place over 14 laps on the International circuit at the Dubai Autodrome and feature 11 different nations, including Germany, Great Britain, Netherlands, France, Sweden alongside local stars from Bahrain, Oman and Saudi Arabia. The Porsche GT3 Cup Challenge Middle East races again on the 27th January 2018, before visiting Abu Dhabi’s Yas Marina Circuit, 2nd – 3rd February 2018. The final two rounds will be held in Bahrain, with the series coming to a thrilling conclusion as an official support race for the 2018 Formula 1 Gulf Air Bahrain Grand Prix.